I, um, got sucked into the epic women’s ice skating contest at the Olympics, and just noticed it was late, so I am just going to post my latest little drawing of a flounder here and remind you to check out my Instagram page. This is a great tusked behemoth flounder of appetite wandering a world of appetite, cheap meat, and those little elves that bake cookies. Vultures soar over the lumbering creature hoping a carcass will appear in its wake. Also there is an artichoke (a delicious edible thistle/vegetable). We’ll get back to some proper posts next week, but this enigmatic creature is not without a certain comic grandeur. 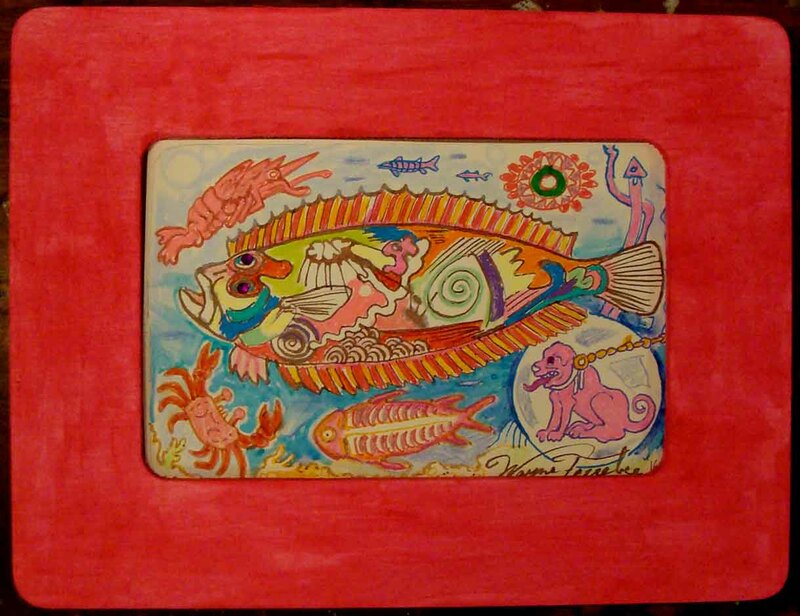 I have been working on a flatfish themed art project! There will be more to announce soon and great fanfare: I promise. However, for now, to tease the wonders that are to come, here are a number of small flatfish artworks that I have been making at lunch and on the train and during similar spare moments. 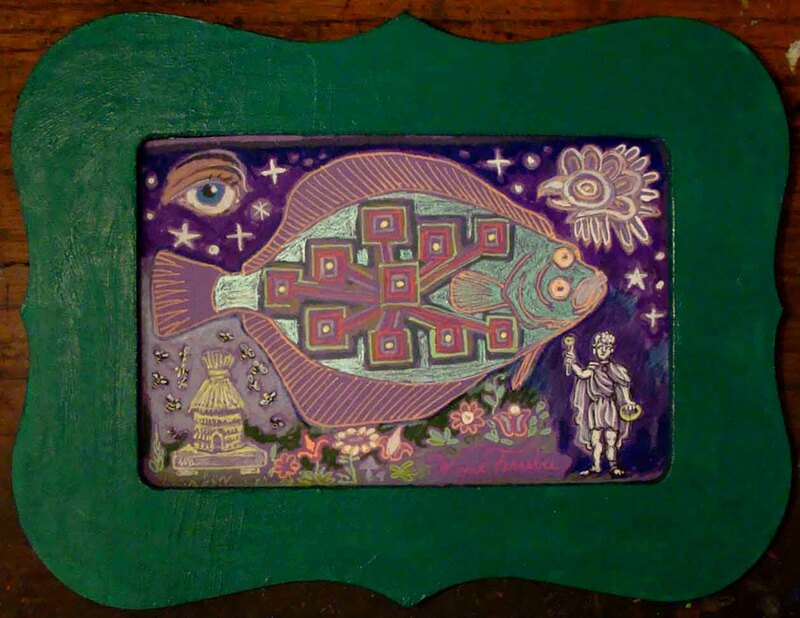 Wordpress hates me with undying vehemence (which is to say, if I label a picture with its name, their program drags it off-center and makes it look ugly), so I am going to write the name in the body of the tex beneath each little fish, and write a short blurb. Please, please let me know what you think, even if it is a one word assessment and I will keep working on my big presentation! 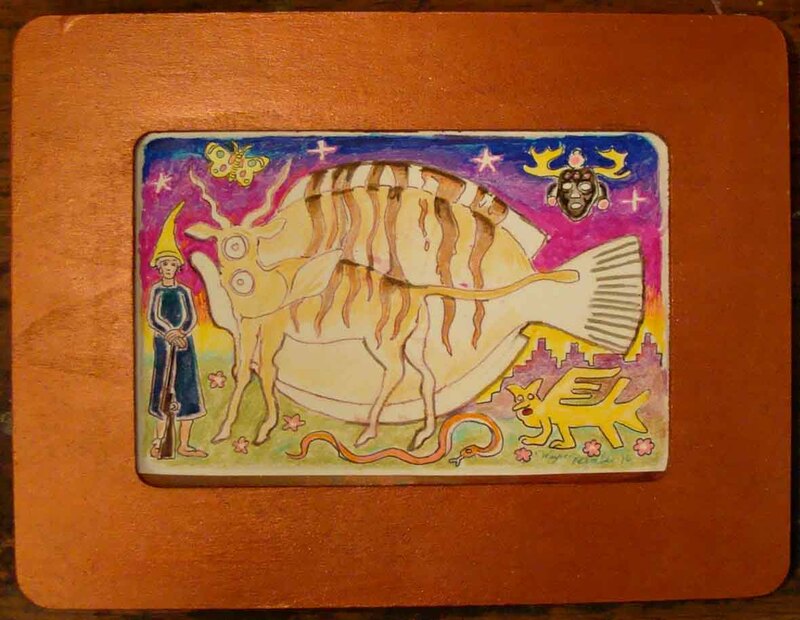 Oh–the picture at the top is: Bongo Flounder (Wayne Ferrebee, 2016, colored pencil and ink on paper) it depicts a bongo turning into a flounder through the auspices of the horned god. A baffled yokel hunter watches in astonishment. Morphing animals are a big problem for me (sigh), so this image has deep personal meaning. 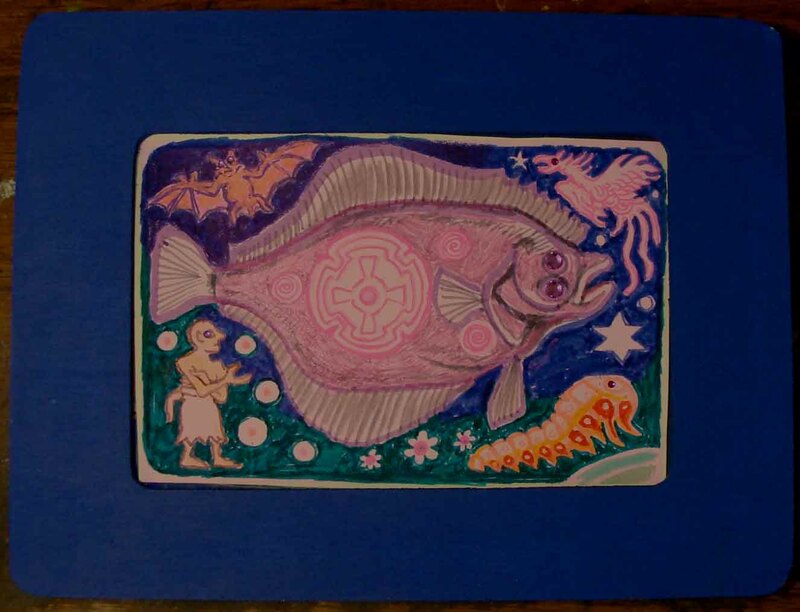 Baterpillar fluke (Wayne Ferrebee, 2016, colored pencil and ink on paper): A Sumerian walking at night sees a mystical fluke surrounded by nocturnal garden creatures. 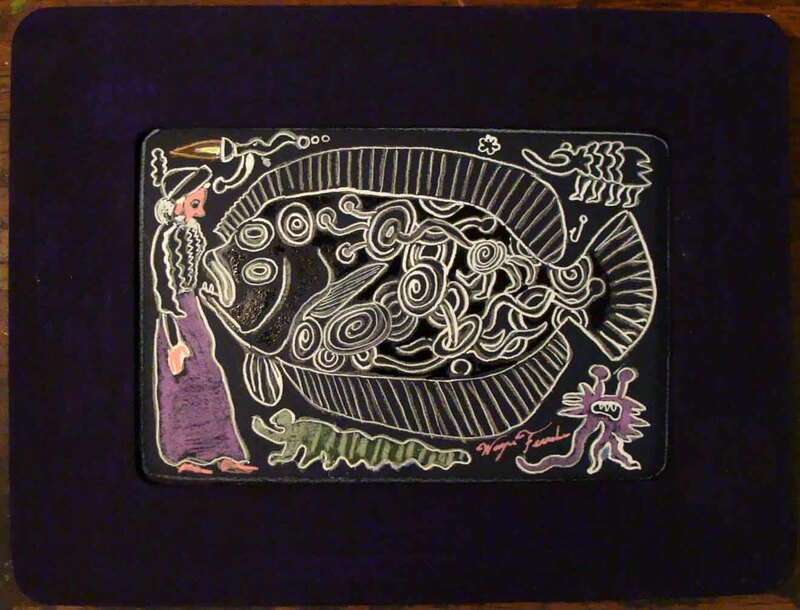 Arcane Flounder (Wayne Ferrebee, 2016, colored pencil and ink on paper): An Armenian mystic walking at night contemplates the intricacies of a magical flatfish surrounded by arcane creatures. BustaFlounder (Wayne Ferrebee, 2016, colored pencil and ink on paper): a flounder parties too hard and is forced to re-live the disgraces of the 1980s New York art scene. A chained mastiff and disappointed prawn look on with weary resignation. Flatfish in the Night Garden (Wayne Ferrebee, 2016, colored pencil and ink on paper): through the intercession of various ancient deities, a hive of bees is allowed to plleneate at night. The relentless geometrical shape on the shimmering dab’s back indicates that such a work ethic may have inscrutible consequences. 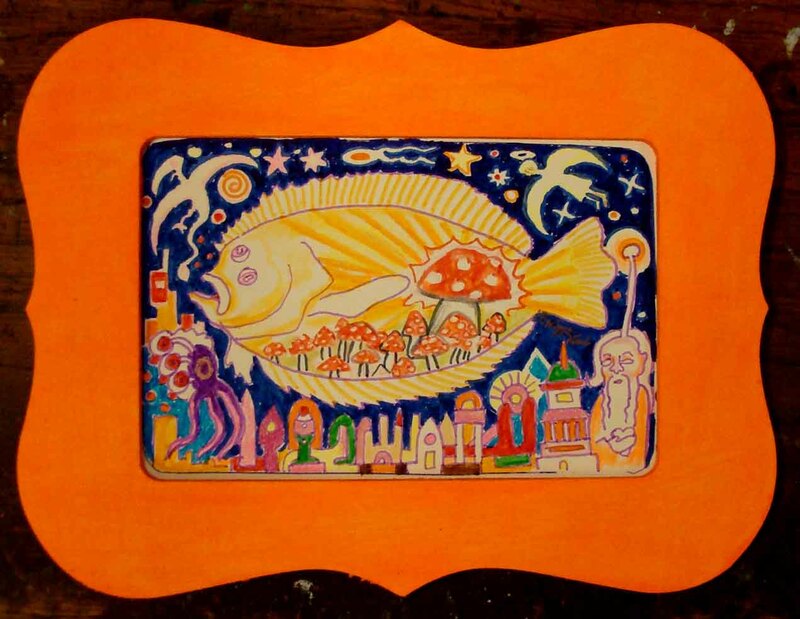 Gnome City Flatfish (Wayne Ferrebee, 2016, colored pencil and ink on paper): A small colorful city is overtaken by a fungal outbreak as winged beings fly by. Hopefully you have enjoyed this little flounderful gallery. Like I said, get ready for some exciting news (hint, hint: the launch of an ancillary site for Ferrebeekeeper). keep on commenting and i will keep on floundering. Thanks! There are about 120 living species of marine mammals (although that total may tragically become much smaller in the very near future). Of this number, only one species is herbivorous. The mighty dugong (Dugong dugon) is the last animal of its kind, a gentle lumbering remnant of the giant herds of sirenian grazers which once graced the world’s oceans. Dugongs are distinct from the three extant species of manatees (the world’s other remaining sirenians) in that they never require fresh water at any point of their lives. Additionally dugongs possess fluked tails in the manner of dolphins and whales. 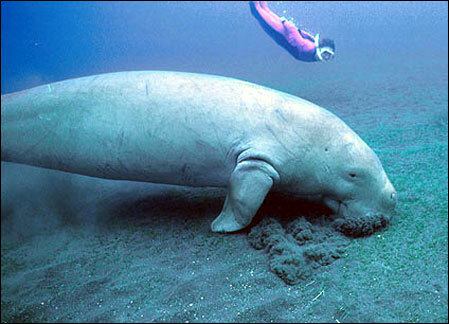 Dugongs live in shallow tropical waters of the Indian Ocean and the Pacific Ocean. 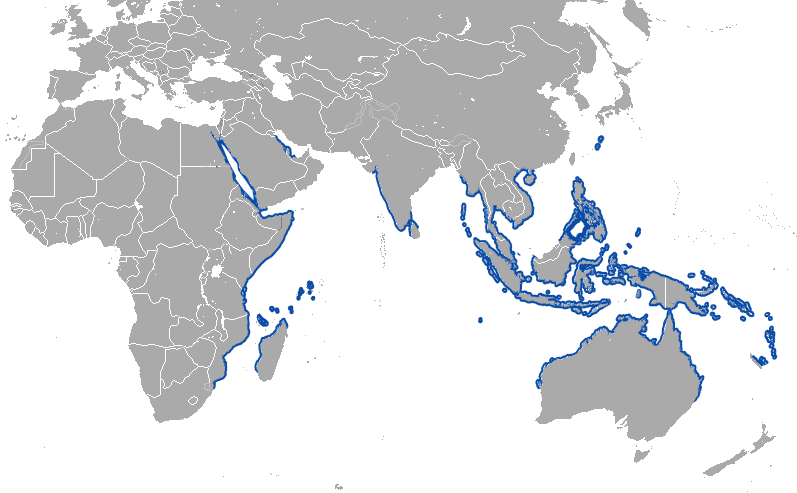 They range from Madagascar to the Philippines, but are only common along the north coast of Australia (where conservation efforts and a limited human population have allowed them to live in peace). Dugongs can swim in deep oceans for a limited time, but prefer to stay on continental shelves where they can feed on seagrass and marine algae. Their all-salad diet does not prevent them from growing to substantial size: some individuals have been known to reach more than 3.5 meters in length (11 feet) and weigh over 950 kilograms (nearly a ton). Although Dugongs can live more than seventy years, they reproduce extremely slowly. Females gestate for over a year and then suckle their calf for around 18 months. Calves may stay with their mothers for many years after being weaned and need almost contact with their mothers for security and affection until they are almost grown. Young dugongs swim with their short paddle-like flippers, but adults use their tail for propulsion and only steer with their flippers. 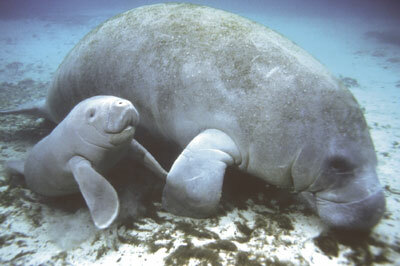 Dugongs have a variety of vocalizations with which they communicate. Usually they live in small family units. Great herds are not unknown but seagrasses do not grow in sufficient quantity to support such numbers together for long. Like the other sirenians, Dugongs have dense bones with almost no marrow (a feature known as pachyostosis). It has been speculated that such heavy skeletons help them stay suspended just beneath the water in the manner of ballast. The lungs of dugongs are extremely elongated, as are their large elaborate kidneys (which must cope with only saltwater). Additionally, the blood of dugongs clots extremely rapidly. 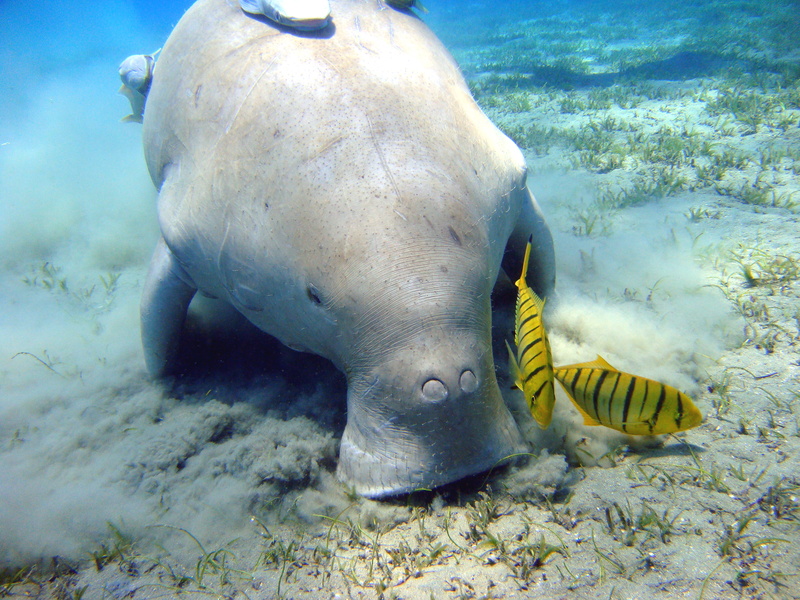 Dugongs face a number of natural threats, particularly storms, parasites, and illnesses. Because of their large size they are only preyed upon by alpha predators such as large sharks, killer whales, and salt-water crocodiles. As with other marine animals, the greatest dangers facing dugongs come from humankind. For millennia Dugongs have been hunted for meat, oil, and ivory. Traditional medicine from various portions of their range (wrongly) imputes magical properties to parts of their bodies. Worst of all, dugongs are frequent victims of boat collisions or are killed as by-catch by fishermen trying to catch something else.